Embattled Governor Okezie Ikpeazu of Abia state who was sacked from office on Thursday by a Federal High Court Abuja for alleged tax evasion declared yesterday that democracy was on trial in the state but vowed to challenge the court verdict up to the Supreme Court. 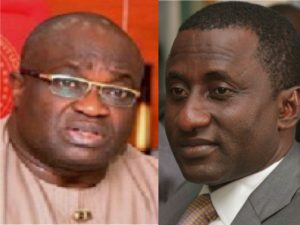 Justice Okon Abang of the Federal High Court, Abuja had in his judgement on Monday ordered INEC to issue a certificate of return to Ikpeazu’s challenger, Dr Uche Ogah and also ordered Ikpeazu to vacate office. The development caused tension in the state on Thursday, following an alleged attempt by Ogah to get the state Chief Judge, Justice Theresa Uzokwe, to swear him in as the governor. 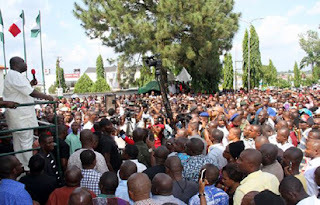 Briefing newsmen at the Presidential Lodge, Government House, Umuahia, yesterday, Ikpeazu who was flanked by his deputy, Chief Ude Oko Chukwu, the Deputy Speaker of the House and some of his aides, said the illegality would not stand and that he remained the governor. He said, “I am still the governor of Abia, so, I appeal to our people to remain calm until the final verdict of the Supreme Court. This illegality will not stand. I will test the judgment in the Appeal Court up to the Supreme Court. “Even if it was a death sentence, I don’t think that I will be executed without right of appeal. He said, “We are baffled by the urgency and the desperation to bounce into the government and when put side by side with the various criminal charges which border on different kinds of things which are subsisting in various courts in Lagos State against this same person, it becomes a little bit clearer why the desperation in the first place; (it’s) probably just to get a veil of immunity just to run away from the certainty of the court’s decision for or against him as it were. “What is on trial is our democracy; it is not about me as a person, but it is about the will of the people of Abia State. And why it is very difficult for the Abia people to accept it is that everyone knows that I have been working for the government in this environment. “My last duty post was (in) the Abia State Environmental Protection agency and for anybody to say that I have problems with my tax, it will be strange to our people because they know I was working for the government and the government was paying me. “The Board of Internal Revenue, whose duty it is to assess and levy tax has come out with the document and said it was issued by them and if there is any question to be asked, the BIR is the one to answer the question. The governor expressed surprise at the turn of events after he had filed an appeal to the judgement obtained by Ogah against him before an Abuja Federal High Court, which had annulled his election based on tax receipts. He said, “Even if it was a death sentence that was passed on me, I don’t think I deserved to be executed without my right of appeal and that right is undeniable and fundamental.” He described the court judgement as a temporary set-back and a plan to ambush the mandate which the people freely gave him in April 2015. Ikpeazu said there was a court order restraining the state chief judge or any other legal officer in the country from swearing in Ogah, adding that he was still the governor.